Euglena are single celled organisms that belong to the genus protist. As such, they are not plants, animal or fungi. In particular, they share some characteristics of both plants and animals. While they can manufacture their own food, a characteristic seen in plants, they are also capable of movement and also consume food, which are characteristics of animals. * Euglena also has been described as having an eyespot at their anterior end that serves to detect light. Euglena are single celled organisms and thus cannot be seen with the naked eye. For this reason, a compound microscope has to be used to observe and study them. They can be found in algae or pond weed in pond water. The organism can be found in water (ponds, shallow water surface etc) that contains organic material. They can therefore be easily collected and prepared for viewing. 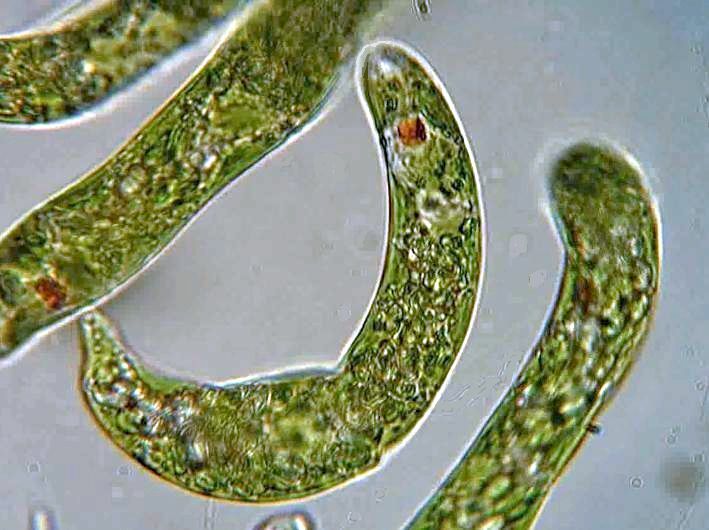 If collected from pond water, Euglena can be viewed directly under a compound microscope. However, if collected with pond weed, then students can carry out a simple culture experiment to grow and increase their numbers. Using a dropper, obtain some pond water or the brown scum from the culture and place a drop of the sample on a microscope glass slide. Place the cover slip gently on the sample and place the slide on the microscope stage for observation. When viewed under the microscope, the slide will show both amoeba and Euglena as they are common in pond water and pond weed. Although students can also see amoeba in the sample, it is possible to differentiate them from Euglena. Here, students will observe them (Euglena) as elongated organisms with a whip like tail on one end. At 40X, Euglena appear like tiny particles making small movements in the water. As magnification increases to 100x and 400x, students will notice that they appear green/light green in color with dark spots inside as well as a whip like tail. Higher power will also show colored granules, which are referred to as the eyespot. 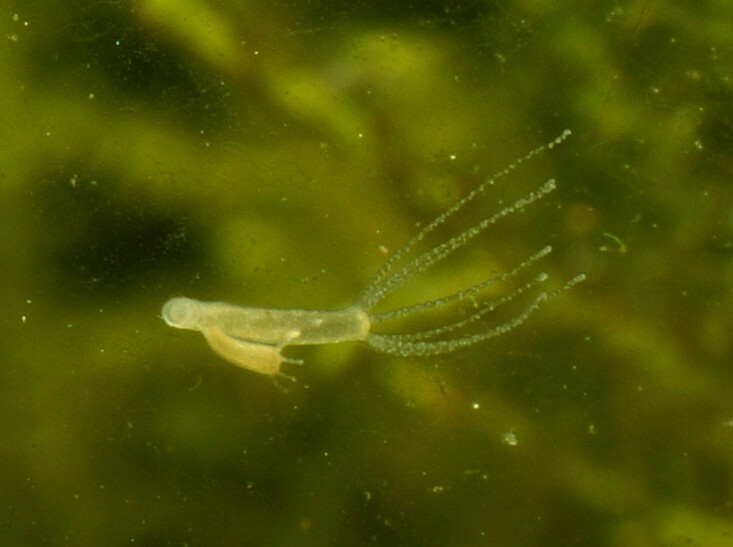 * The whip-like tail at the front end of the organism is small and colorless (transparent). Students have to look carefully to see them. When viewed under the light microscope, Euglena appear as elongated unicellular organisms that are rapidly moving across the field surface. One thing that students will notice as soon as they begin to observe the organism is that it has a blunt (rounded) end portion and a pointed end (this gives them a tear-drop shape). Although this is not the case with all, it is the most common appearance. The blunt, more rounded end is often the "head" part from which the whip-like tail (flagella) is attached. because of the presence of a flagellum, Euglena are also known as flagellates. 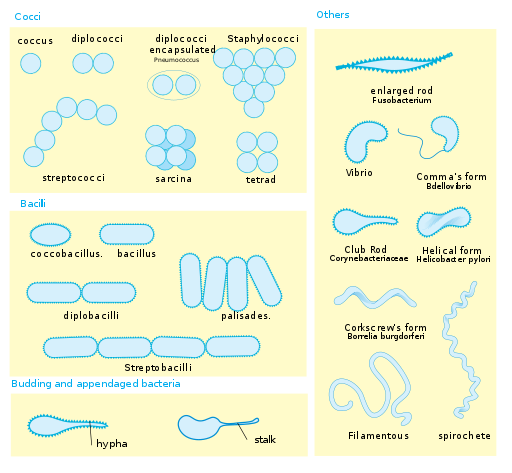 Although one flagellum is often seen, they have two flagella, one of which is often hidden in a part of the Euglena referred to as reservoir. Unlike most plant cells, this species do not have a cell wall. The organelles of the organism and its cytoplasm are therefore bound by a plasma membrane that allows for easier movement. Observation of Euglena under more powerful electron microscopes have revealed the presence of an ornamented pellicle under the plasma membrane. The presence of this thin protein layer protects the their cell membrane and also helps in maintaining their shape. Moreover, because of their flexible nature, they also facilitate movement. * The pellicle under the membrane is composed of a protein layer that is supported by microtubule structures. These tubules are arranged in strips spiraling around the cell. As they slide over each other, these strips enhance flexibility and contractility of the membrane making it possible for the organism to squeeze and pass through tiny spaces. A closer observation of the organism will reveal a reddish spot at the anterior part of the Euglena. This is an important organelle that contains carotenoid granules that allows the organism to sense and move towards sunlight. The eyespot also helps filter the wavelength of light that reaches the paraflagellar body, which is the light detecting structure that lies at the base of the flagellum. In response to this, Euglena moves towards the source for photosynthesis. This bodily movement of the organism is commonly known as positive phototaxis. In addition to the red eyespot, students will also notice dark (greenish) spots throughout the body of the organism. Some of these spots are chloroplasts that contain chlorophyll that produces the green hue and responsible for photosynthesis. This is typically referred to as chlorophyll A. Some organisms have both chlorophyll A and B. For such, chlorophyll B produces a bluish green color and enhance the absorption of light required for photosynthesis. Chloroplast in the organism trap light (sunlight) that is used to manufacture food through photosynthesis. This makes them autotrophic organisms given that they are capable of making their own food when there is sunlight. Although they are capable of making their own food, they are also heterotrophic, which means that they also consume food. 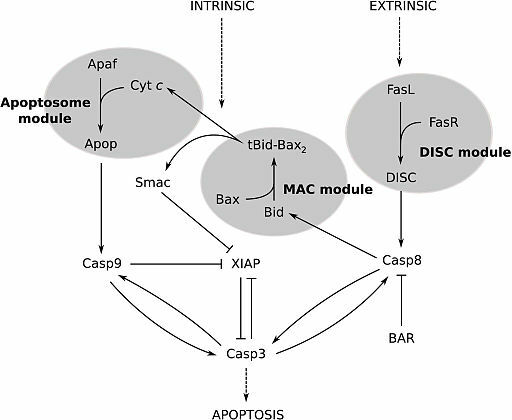 Food consumption by heterotrophs takes place through phagocytosis. Here, the organism engulfs the food particle in a vacuole to be digested. In the vacuole, enzymes are released to digest the food particle. 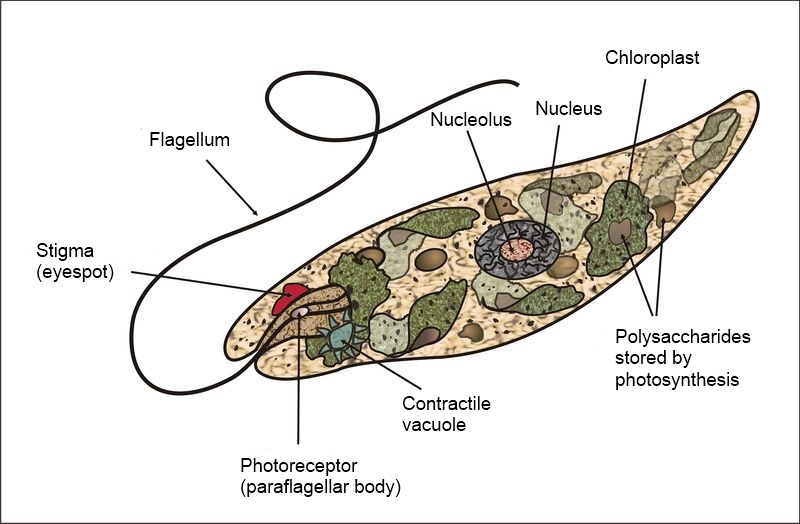 Euglena also has a contractile vacuole that helps collect and remove excess fluids from the cell. This prevents the cell from taking in too much water that can cause the cell to rupture. 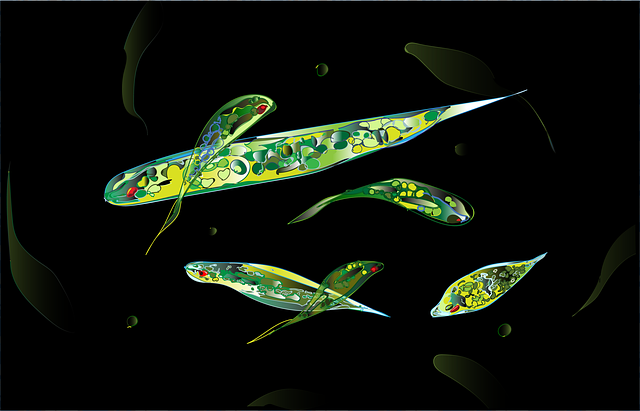 Euglena are neither plants nor animals despite the fact that they have characteristics of both. Given that they cannot be groups under either the plant or the animal kingdom, Euglena, like many other similar single celled organisms are classified under the Kingdom Protista.